Whether you have a large reborn collection or you are looking to buy for the first time, when you set out to purchase a reborn doll, there are many things you will want to look for. A good, quality reborn takes a lot of time, commitment, knowledge, and money to create. There is no such thing as a "cheap" reborn doll. It is VERY rare to find a doll that cost the artist less than $100 to make, and those dolls are not typically the ones you would want to buy if you were looking for an heirloom baby doll. I typically spend about $200 to create a single newborn-sized doll, and that is not counting any of the 20 to 30 hours of labor I put into creating the reborn baby. You should look for a reborn doll that is made of quality products; you want your baby to last a lifetime, and so he or she should not be made from bare minimum supplies. If a reborn artist doesn't supply much info on what was used to create the doll, I would be wary. If sufficient information is not provided, ask the artist questions before you buy. Most artists are glad to answer questions about their dolls. The standard type of paint used in the reborn industry is Genesis Heat Set Paints. In my opinion, and in the opinion of most in the reborn community, Genesis Paints are the best paints to use on a reborn. They are heat set into the vinyl after every single layer of paint so that they adhere to the vinyl permanently; the colors will not fade or rub off over time. However, some reborn artists use varying types of artist oils, which if applied in thin layers and allowed to cure in between, can still work well. But even if an artist uses the proper types of paint, you will need to pay close attention to how it was applied. Paint applied too thickly can look ugly or leave unrealistic and unflattering edges in the skin tone. If there are not any photos that are close-up enough for you to really see how the skin tone looks, ask the artist for closer photos. Watch out for shine, too. A very minimal amount of shine on smaller areas such as toes and fingers is to be expected from vinyl, especially on a doll that is not sealed with a matte sealer. But there should not be an excessive amount of shine all over the limbs and/or face; a reborn should definately not look wet when it obviously does not have water on it. This could indicate that the doll was scrubbed with acetone prior to painting, and such a method prevents the paints from properly adhering to the vinyl in a permanent fashion. Check what kind of body the reborn in question has. A cloth-bodied reborn should have a jointed body made from sturdy material such as suede, doe-suede, heavy cotton, or flannel. The joints are a very important feature. If the body is not jointed, it will be much more difficult to pose, and the reborn will not look or feel as realistic. The filling is an important part of the body as well. Sand as a filling is NEVER acceptable. A doll weighted with sand cannot be shipped overseas, and if a colored art sand was used, the colors of the sand could seep through the vinyl and destroy the reborn over time. Polyfil, glass beads, and hard poly pellets are the most common things used in filling and weighting and are all perfectly safe for you and your doll. Sometimes to add extra weight, artists will use metal pellets in their reborns. This is just fine, but make sure they are using steel pellets and not lead—it can be hard to find steel ones so you'll want to make sure they didn't skimp and use lead in the reborn doll. Another popular stuffing material is the soft "baby fat" pellets. These are fantastic in the body and add a realistically squishy feel, but if an artist mentions using these pellets, make extra sure that they used them only inside of the doll's cloth body and not in the limbs or head. The soft pellets can have a reaction with the vinyl which can cause it to deteriorate over time. Do not assume that just because the hair looks nice in the front it looks nice in the back as well. Look for a reborn that has been photographed from all angles, showing you the hair in the front, the back, and all sides. Be wary of artists who only photograph their reborn with hats on—and that goes for both rooted and hand-painted hair. On rooted reborn babies, angora goat mohair is the standard. It is very soft and feels like the tender wispy hair of a real baby. Synthetic hair is not a good choice for a rooted doll for many reasons, and human hair is best saved for larger dolls, such as long-haired toddler and child reborns since it is too thick and coarse to lay flat on a small baby head. The hair should always be sealed from the inside with a waterproof adhesive. If it is not, the hair could fall out when you brush or wash your reborn's hair in the future. On a wigged doll, the wig should be glued on with a waterproof adhesive. For wigs, synthetic hair is fine, but a mohair wig will look and feel much more realistic. Some human hair wigs are alright, but as a general rule, human hair is best on bigger dolls, both rooted and wigged. While it is true that there are fantastic artists out there that just aren't skilled with a camera, there still should be plenty of close-up photos showing all the little details of a reborn. A poorly made reborn dressed in a really fancy dress and displayed only at a distance with really fancy props is still a poorly made doll. Check for photos of the nails, all of which should be properly manicured and lightly glossed. Look for close-ups of the skin tone, the lips, the eyes, the veins. If it is an awake reborn, look closely at the eyes. Make sure they are aligned properly and that there aren't any gaps between the eyes and the eye socket; they should fit perfectly. Awake or sleeping, check the eyelashes. Sleeping dolls should have rooted eyelashes and awake dolls could have either (though it is more common for an awake doll to have lashes that are applied rather than rooted), but make sure the lashes are not too overwhelming for the doll or applied too low or high. 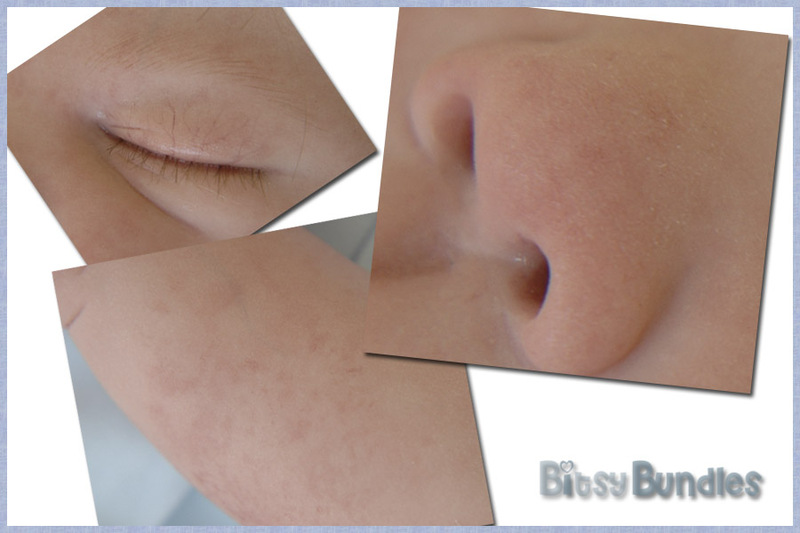 If there are any birthmarks or skin blemishes, you should be able to inspect these, too. Make sure you can check all angles of the reborn so you don't end up with any "surprises" when you open the box containing your new reborn. Finally, before buying, make sure you check up on the artist. 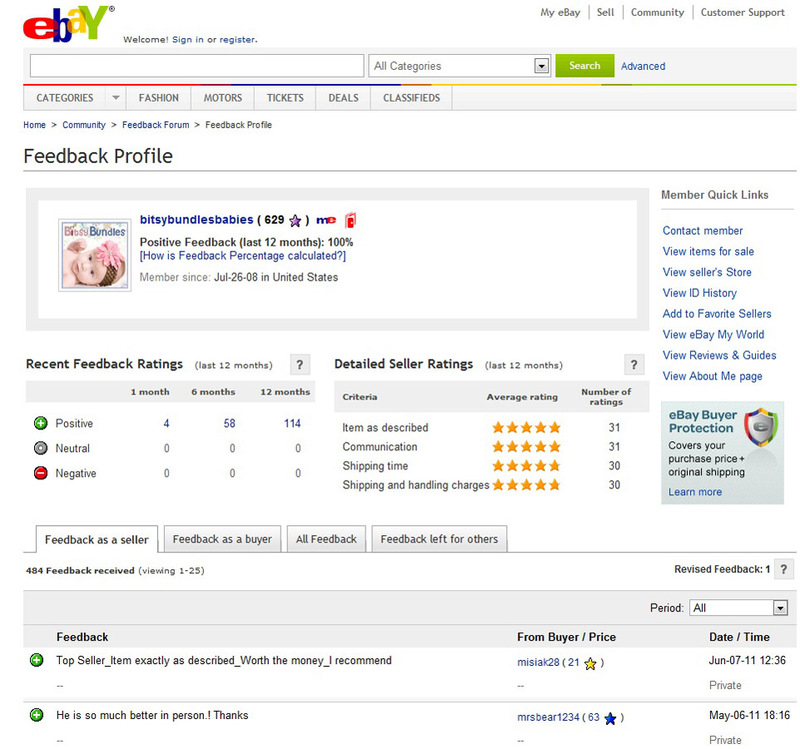 Most reborn dolls are purchased through ebay, where all buyers and sellers have feedback. 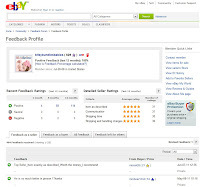 It's true that not everyone remembers to leave feedback for a purchase, but there should be at least some comments to read. Keep in mind that things such as shipping time does not affect the quality of the doll, and since reborns are commonly shipped overseas, a seller's ratings might be slightly lower in the shipping time/costs category because many buyers are uninformed about the time constraints and costs in shipping something as heavy and expensive as a reborn doll, especially when going from one country to another. Check instead for the comments buyers have left for their artist. Were they happy with their purchase? Did they have any complaints about their reborn? Also look at the artist's "About Me" page, and their personal website if they have one. 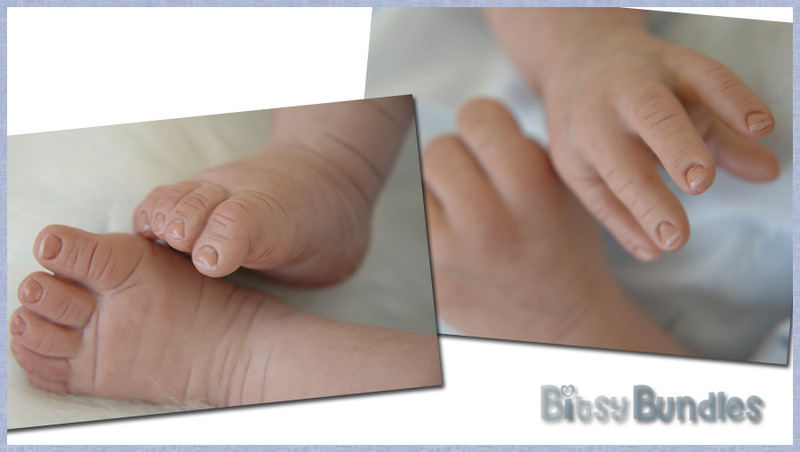 Get to know the person who is creating your potential new reborn baby. Make sure they know what they're doing. I hope that this reborn buying guide will help you as you look for that perfect little reborn. If you're looking for a specific baby, I do offer custom reborn dolls under the purchase section of my website. You could also sign up for my newsletter or check my ebay store for reborns that I auction. If you have any comments or questions, feel free to email me or to write them in the comments below. I want a reborn sooo much but idk what artist?! What do u recamend?? ?